Craniomaxillofacial imaging plays a significant role in clinical examinations. Three-dimensional (3D) imaging devices and techniques are an important part of this. 3D imaging techniques can be broadly categorized as laser scanning, stereophotogrammetry, structured light techniques, and cone beam computed tomography scans. External soft tissues of the craniomaxillofacial regions can be recorded appropriately owing to these technologies. The 3dMD face system (3dMD, Atlanta, GA) is an advanced stereophotogrammetry system which uses multiple cameras to capture an 180° image of a person's face from ear to ear in only 1.5 ms. 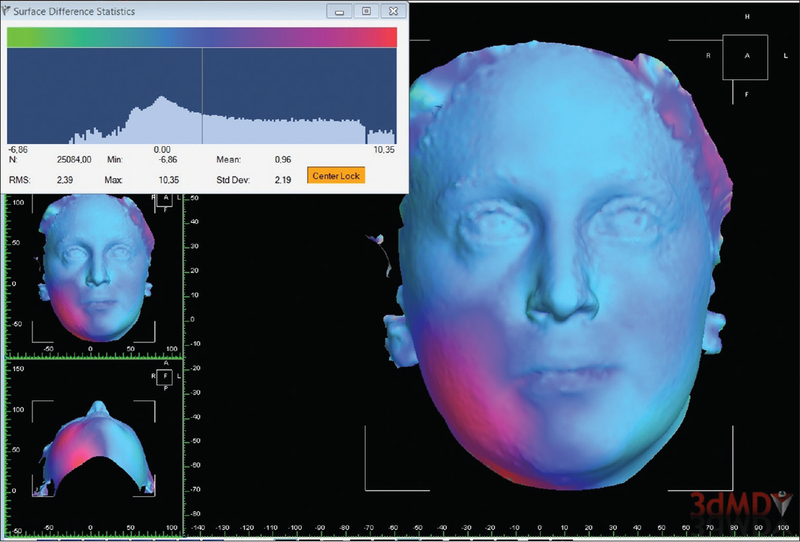 Traditional methods have limitations for investigating craniomaxillofacial changes, but the 3dMD imaging system provides faster, noninvasive, and more accurate data, stored in digital format. This 3dMD system has been applied in several studies such as variation in facial morphology, assessment of facial anomalies,, changes in lip morphology following correction of functional anterior crossbite, changes in facial soft tissues that occur after use of different rapid maxillary expansion appliances, and assessment of nasolabial appearance in patients with complete unilateral cleft lip and palate. To the best of our knowledge, up to date, the effect of LLLT on swelling has not been assessed with 3dMD imaging system except for our previous study. There are many studies which use LLLT in mandibular third molar extraction and had shown different and controversial results in pain, swelling, and trismus scores.,,,,,, Our first objective was to determine whether LLLT reduces the morbidities of third molar surgery as compared to placebo and to contribute to literature associated with that ambiguous topic. Second, we aimed to determine objectively the effects of LLLT on facial swelling in three dimensions using a 3dMD imaging system. The present prospective, single-center, randomized, double-blind pilot study was conducted on patients recruited who required third molar extraction. This study was approved by the Human Ethics Committee and was performed in accordance with the Declaration of Helsinki. A total of 45 healthy patients with a single impacted mandibular third molar in similar positions (Class II-III and position B, Pell and Gregory's classification) along with the same degree of surgical difficulty were enrolled into the study. Patients were randomized into three treatment groups (n = 15); Group 1, the control group, received only routine management (ice application); Group 2, laser group, received single-dose LLLT immediately after surgery; and Group 3, sham group (negative control group), received sham LLLT immediately after surgery. Sample allocation was done by simple randomization. All subjects were informed of the risks of oral surgery and experimental treatment, and informed written consent was obtained from all patients and to participate in the clinical trial. The 45 patients meeting the inclusion criteria had the following characteristics: male or female gender, healthy, asymptomatic, had no systemic disease, completely bone-impacted mesioangular lower third molars, and surgical difficulty Grades II to III. Exclusion criteria included contraindications to laser therapy, systemic disease, local infection, cigarette or tobacco use, penicillin/paracetamol/chlorhexidine allergy, oral contraceptives' use, pregnancy, lactation, and asymmetric or semi-impacted third molars. All the operations were performed by the same surgeons using a standardized procedure: local anesthesia with 40 mg/mL of articaine (Ultracain®, Sanofi Aventis, Topkapı, Istanbul, Turkey) associated with 1:200,000 epinephrine was administered. A full-thickness three-cornered mucoperiosteal flap was raised, and bone removal and/or tooth sectioning was performed. Lower third molars were extracted using round and fissure burrs under saline irrigation. The mucoperiosteal flap was repositioned and the surgical wound was closed using a 4-0 silk suture. The duration of the surgical procedure was noted. After surgery, all patients were prescribed 1000 mg amoxicillin-clavulanic acid (2 times/1 day) and 500 mg paracetamol orally (2 times/1 day) and a 0.2% chlorhexidine mouth rinse (1 min, 3 times/1 day) for 1 week. A gallium-aluminum-arsenide (GaAlAs) diode laser device (CHEESE Dental Laser System, Wuhan Gigaa Optronics Technology Company, China) with a continuous wavelength of 810 nm was used, and laser therapy was applied extraorally at the insertion point of the masseter muscle using a 600-μm handpiece. LLLT was performed on all patients of Group 2 and Group 3 by a different operator; measurements (mouth opening and swelling) were performed by another operator who was blinded to patient allocation. Parameters of the LLLT are summarized in [Table 1]. A 10-cm Visual Analog Scale (VAS) ranging from 0 (absence of pain or discomfort) to 10 (maximum pain or discomfort) was used to evaluate postoperative pain intensity. The patient who received an explanation about how to measure pain intensity marked the scale to score the degree of pain with a number between 0 and 10 at 2 and 7 days after surgery. Mouth opening was recorded by measurement of the maximal distance between the inter-incisor opening using manual calipers before the surgical procedure and 2nd and 7th days postextraction. Three-dimensional photographic images were captured by the 3D (3dMD Face®, Atlanta, GA) Photogrammetric System. The 3dMD system uses a synchronized digital multicamera configuration, with three cameras on each side (one color, two infrared) that capture photo-realistic quality pictures. The distance (patient to camera) was standardized to the duration of the study. The system can capture 180° facial images from ear to ear. 3D images were loaded in the 3dMD software 3dMD Vultus (3dMD, Atlanta, GA). T0 and T1 images were opened and superimposed on the forehead and bridge of nose as suggested by the manufacturer. The forehead and the bridge of the nose were not affected by swelling. After superimposition, the swelling was calculated by selecting the area of the swelling and subtracting the two images. A preoperative 3dMD image was taken immediately before surgery for comparison with the postoperative appearance. Postoperative 3dMD images were taken on the 2nd and 7th days [Figure 1] and [Figure 2]. The recorded data were analyzed using the SPSS 22.0 software (IBM SPSS, Istanbul, Turkey). The Shapiro–Wilk test was used to test for normal distribution of data of individual parameters. Differences in individual parameters among the groups were tested using the Tukey's honest significant difference test for normally distributed variables (trismus) and the Mann–Whitney U-test for abnormally distributed variables (swelling and pain). Kruskal–Wallis test was used to assess if a statistically significant relationship existed between two categorical variables. Wilcoxon signed-rank test was used for intragroup evaluations for VAS and edema. Variance analysis was used for repetitive measures in the intragroup evaluations for the mouth openness, and Bonferroni test was used for the post hoc evaluations. Chi-square test was used for the comparison of qualitative data. P < 0.05 was considered statistically significant. Twenty-five (55.6%) women and 20 (44.4%) men, aged between 17 and 29 years, were studied on a total of 45 cases. The mean age of the cases was 21.11 ± 4.15 years. The cases were examined under three groups of 15 persons each. The mean operation time was 15.27 ± 5.85 min in Group 1, 14.03 ± 3.77 min in Group 2, and 15.33 ± 2.06 min in Group 3. There was no statistically significant difference between the groups in terms of mean duration of operation (P > 0.05) [Table 2]. Statistical analyses showed no significance in the differences between all groups for the edema and trismus results (P > 0.05). However, laser group had the lowest scores [Table 3] and [Table 4]. Regarding VAS scores, there was a significant difference only between laser and sham groups on postoperative day 2. 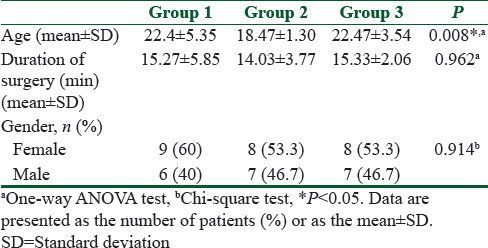 At the 7th postoperative day, pain in the laser group was significantly less than that in the sham and control groups (P < 0.05); however, on day 7, the values were similar in the sham and control groups (P > 0.05) [Table 5]. The mandibular third molar surgical extraction is often related to severe postoperative discomforts. Previously, Oikarinen suggested that there may be a close relation between postoperative morbidities and operation time. In the present study, there was no difference between the groups in terms of operation time. Preventive strategies for the management of postoperative morbidities of third molar surgery include the use of local or systemic corticosteroids, nonsteroidal anti-inflammatory drugs, different flap techniques, and nonmedication methods such as compression, cryotherapy, ozone therapy, and LLLT.,,,, Since some medications have side effects, we thought that a new nonmedication and comfortable treatment model is necessary. LLLT has been shown to modulate the inflammatory process without adverse effects. Thus, in the present study, the efficacy of LLLT was investigated in regard to pain, swelling, and trismus following mandibular third molar surgery. Some authors applied LLLT only extraorally or only intraorally,,,,, whereas a number of clinical trials have performed both extraorally and intraorally.,,, Aras and Güngörmüş have reported that extraoral application of LLLT is more effective than intraoral use for the reduction of postoperative trismus and swelling. It may be that the extraoral laser application could directly have an effect on the masseter muscle. Oral surgery might cause spasm of some muscles, especially the masseter. However, intraoral laser therapy does not directly affect the masseter muscle. Therefore, in the current study, the LLLT was used extraorally. There are many types of LLLT devices and these devices have different wavelength and doses. Ferrante et al., Aras and Güngörmüş, Marković and Todorović, and Kazancioglu et al. reported beneficial results and they have applied values of “980-nm, 54 J,” “808-nm, 12 J,” “637-nm, 4 J/cm2,” and “808-nm, 12 J,” respectively. On the other side, López-Ramírez et al. and Amarillas-Escobar et al. reported inefficient results and they have used values of “810-nm, 5 J/cm2” and “810-nm, 4 J/cm2,” respectively. It seems that there is no correlation between wavelength, doses, and success of LLLT therapy. However, there is no evidence of the effect of different doses on postoperative morbidities of third molar surgery. The effect of LLLT on postoperative morbidities of third molar surgery is controversial. Ferrante et al., Kazancioglu et al., Aras and Güngörmüş, and Marković and Todorović reported that LLLT can reduce postoperative pain after mandibular third molar surgery, which is consistent with the findings of the current study. However, according to clinical studies by Escobar et al. and López-Ramírez et al., there was no positive effect on pain with LLLT. The difference in the pain scores between the current study and that of Kazancioglu et al. may be due to the sample of the studies, different flap technique, or difficulty levels of surgeries. Mandibular third molar surgery may cause spasm of some muscles, especially masseter (trismus). To evaluate trismus, the maximum mouth opening was measured with manual calipers. According to the findings of the current study, there was no statistically significant difference between the trismus scores of the three groups, which is similar to the findings of López-Ramírez et al. and Røynesdal et al. However, Carrillo et al. and Aras and Güngörmüş reported that LLLT had positive effects on trismus. Lack of evidences associated with different doses and application type (extraoral/intraoral) of LLLT on the postoperative indications to minimize pain, swelling, and trismus after surgical removal of mandibular third molar is the limitation of the present study. This study has demonstrated that there is not enough evidence for considering LLLT therapy to be a useful and efficient treatment for the reduction of postoperative morbidities of mandibular third molar surgery. However, it was observed that single-dose LLLT reduced the intensity of pain following third molar surgery. The results of this study revealed that LLLT reduced facial swelling, but no significant differences were found among the three groups. The improvement of tools, methodology, and treatment plans is necessary to achieve this goal. In addition, a 3D craniomaxillofacial imaging method provided insight into volume changes after third molar surgery and the evaluation of facial swelling in an objective way. Grossi GB, Maiorana C, Garramone RA, Borgonovo A, Creminelli L, Santoro F, et al. Assessing postoperative discomfort after third molar surgery: A prospective study. J Oral Maxillofac Surg 2007;65:901-17. Kazancioglu HO, Ezirganli S, Demirtas N. Comparison of the influence of ozone and laser therapies on pain, swelling, and trismus following impacted third-molar surgery. Lasers Med Sci 2014;29:1313-9. Markovic A, Todorovic LJ. Effectiveness of dexamethasone and low-power laser in minimizing oedema after third molar surgery: A clinical trial. Int J Oral Maxillofac Surg 2007;36:226-9. Koçer G, Yuce E, Tuzuner Oncul A, Dereci O, Koskan O. Effect of the route of administration of methylprednisolone on oedema and trismus in impacted lower third molar surgery. Int J Oral Maxillofac Surg 2014;43:639-43. Kumar N, Prasad K, Lalitha RM, Ranganath K, Dexith J, Chauhan A. Evaluation of treatment outcome after impacted mandibular third molar surgery with the use of autologous platelet-rich fi brin: A randomized controlled clinical study. J Oral Maxillofac Surg 2015;73:1042-9. Osunde OD, Saheeb BD, Adebola RA. Comparative study of effect of single and multiple suture techniques on inflammatory complications after third molar surgery. J Oral Maxillofac Surg 2011;69:971-6. He WL, Yu FY, Li CJ, Pan J, Zhuang R, Duan PJ, et al. A systematic review and meta-analysis on the efficacy of low-level laser therapy in the management of complication after mandibular third molar surgery. Lasers Med Sci 2015;30:1779-88. Ferrante M, Petrini M, Trentini P, Perfetti G, Spoto G. Effect of low-level laser therapy after extraction of impacted lower third molars. Lasers Med Sci 2013;28:845-9. Aras MH, Güngörmüş M. Placebo-controlled randomized clinical trial of the effect two different low-level laser therapies (LLLT) – Intraoral and extraoral – On trismus and facial swelling following surgical extraction of the lower third molar. Lasers Med Sci 2010;25:641-5. Sun G, Tunér J. Low-level laser therapy in dentistry. Dent Clin North Am 2004;48:1061-76, viii. López-Ramírez M, Vílchez-Pérez MA, Gargallo-Albiol J, Arnabat-Domínguez J, Gay-Escoda C. Efficacy of low-level laser therapy in the management of pain, facial swelling, and postoperative trismus after a lower third molar extraction. A preliminary study. Lasers Med Sci 2012;27:559-66.
van der Meer WJ, Dijkstra PU, Visser A, Vissink A, Ren Y. Reliability and validity of measurements of facial swelling with a stereophotogrammetry optical three-dimensional scanner. Br J Oral Maxillofac Surg 2014;52:922-7. Lübbers HT, Medinger L, Kruse A, Grätz KW, Matthews F. Precision and accuracy of the 3dMD photogrammetric system in craniomaxillofacial application. J Craniofac Surg 2010;21:763-7. Seager DC, Kau CH, English JD, Tawfik W, Bussa HI, Ahmed Ael Y, et al. 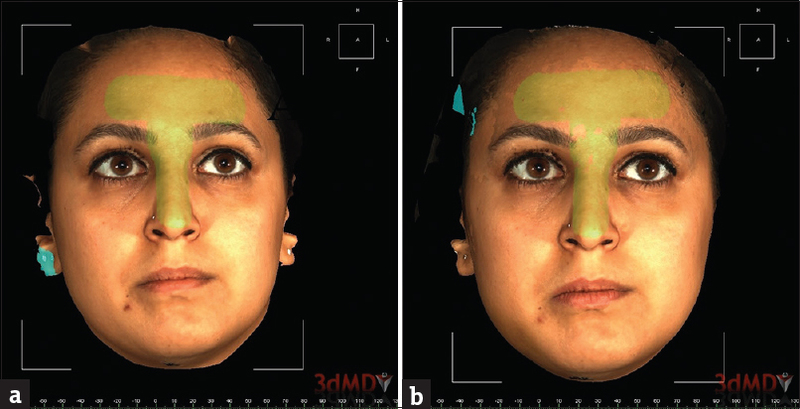 Facial morphologies of an adult Egyptian population and an adult Houstonian white population compared using 3D imaging. Angle Orthod 2009;79:991-9. Weinberg SM, Neiswanger K, Richtsmeier JT, Maher BS, Mooney MP, Siegel MI, et al. Three-dimensional morphometric analysis of craniofacial shape in the unaffected relatives of individuals with nonsyndromic orofacial clefts: A possible marker for genetic susceptibility. Am J Med Genet A 2008;146A: 409-20. Jogaki C, Tome W, Kuroyanagi F, Kitai N. A three-dimensional method for evaluating changes in lip morphology following correction of functional anterior crossbite. Orthod Waves 2017;76:226-31. Altındiş S, Toy E, Başçiftçi FA. Effects of different rapid maxillary expansion appliances on facial soft tissues using three-dimensional imaging. Angle Orthod 2016;86:590-8. Bagante I, Zepa I, Akota I. 3D assessment of nasolabial appearance in patients with complete unilateral cleft lip and palate. Cleft Palate Craniofac J 2018;55:220-5. Alan H, Yolcu Ü, Koparal M, Özgür C, Öztürk SA, Malkoç S, et al. Evaluation of the effects of the low-level laser therapy on swelling, pain, and trismus after removal of impacted lower third molar. Head Face Med 2016;12:25. Fernando S, Hill CM, Walker R. A randomised double blind comparative study of low level laser therapy following surgical extraction of lower third molar teeth. Br J Oral Maxillofac Surg 1993;31:170-2. Amarillas-Escobar ED, Toranzo-Fernández JM, Martínez-Rider R, Noyola-Frías MA, Hidalgo-Hurtado JA, Serna VM, et al. Use of therapeutic laser after surgical removal of impacted lower third molars. J Oral Maxillofac Surg 2010;68:319-24. Pell GJ, Gregory BT. Impacted mandibular third molars: Classification and modified techniques for removal. Dent Dig 1933;39:330-8. Oikarinen K. Postoperative pain after mandibular third-molar surgery. Acta Odontol Scand 1991;49:7-13. Honmura A, Yanase M, Obata J, Haruki E. Therapeutic effect of Ga-Al-As diode laser irradiation on experimentally induced inflammation in rats. Lasers Surg Med 1992;12:441-9. Lievens PC. The effect of the combined HeNe laser and IR treatment on the regeneration of the lymphatic system during the process of wound healing. Lasers Med Sci 1991;6:193-9. Albertini R, Villaverde AB, Aimbire F, Salgado MA, Bjordal JM, Alves LP, et al. Anti-inflammatory effects of low-level laser therapy (LLLT) with two different red wavelengths (660 nm and 684 nm) in carrageenaninduced rat paw edema. J Photochem Photobiol 2001;89:50-5. Marković AB, Todorović L. Postoperative analgesia after lower third molar surgery: Contribution of the use of long-acting local anesthetics, low-power laser, and diclofenac. Oral Surg Oral Med Oral Pathol Oral Radiol Endod 2006;102:e4-8. Carrillo JS, Calatayud J, Manso FJ, Barberia E, Martinez JM, Donado M. A randomized doubleblind clinical trial on the effectiveness of helium-neon laser in the prevention of pain, swelling and trismus after removal of impacted third molars. Int Dent J 1990;40:31. Taube S, Piironen J, Ylipaavalniemi P. Helium-neon laser therapy in the prevention of postoperative swelling and pain after wisdom tooth extraction. Proc Finn Dent Soc 1990;86:23-7. Aras MH, Güngörmüş M. The effect of low-level laser therapy on trismus and facial swelling following surgical extraction of a lower third molar. Photomed Laser Surg 2009;27:21-4. Røynesdal AK, Björnland T, Barkvoll P, Haanaes HR. The effect of soft-laser application on postoperative pain and swelling. A double-blind, crossover study. Int J Oral Maxillofac Surg 1993;22:242-5. Erdogan O, Tatlı U, Ustün Y, Damlar I. Influence of two different flap designs on the sequelae of mandibular third molar surgery. Oral Maxillofac Surg 2011;15:147-52. Kau CH, Cronin AJ, Richmond S. A three-dimensional evaluation of postoperative swelling following orthognathic surgery at 6 months. Plast Reconstr Surg 2007;119:2192-9. Meisami T, Musa M, Keller MA, Cooper R, Clokie CM, Sàndor GK, et al. Magnetic resonance imaging assessment of airway status after orthognathic surgery. Oral Surg Oral Med Oral Pathol Oral Radiol Endod 2007;103:458-63. Al-Khateeb TH, Nusair Y. Effect of the proteolytic enzyme serrapeptase on swelling, pain and trismus after surgical extraction of mandibular third molars. Int J Oral Maxillofac Surg 2008;37:264-8. Cevidanes LH, Oliveira AE, Grauer D, Styner M, Proffit WR. Clinical application of 3D imaging for assessment of treatment outcomes. Semin Orthod 2011;17:72-80. Lane C, Harrell W Jr. Completing the 3-dimensional picture. Am J Orthod Dentofacial Orthop 2008;133:612-20.